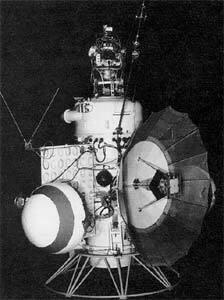 MV2-4 was a modified Venera-type spacecraft in the shape of a cylinder 3.3 m long and 1.0 m in diameter. The spacecraft measured 4 meters across with the solar panels and radiators deployed. The cylinder was divided into two compartments. The upper 2.7 m, the orbital module, contained guidance and on-board propulsion systems. The experiment module, containing the scientific instrumentation, comprised the bottom 0.6 m of the cylinder. A 1.7 m parabolic high gain antenna was used for communication, along with an omnidirectional antenna and a semi-directional antenna. Power was supplied by two solar panel wings with a total area of 2.6 square meters affixed to opposite sides of the spacecraft. Power was stored in a 42 amp-hour cadmium-nickel battery. Mars 1 was an automatic interplanetary station launched in the direction of Mars, with the intent of flying by the planet at a distance of about 11,000 km. It was designed to image the surface and send back data on cosmic radiation, micrometeoroid impacts and Mars' magnetic field, radiation environment, atmospheric structure, and possible organic compounds. After leaving Earth orbit, the spacecraft and the booster fourth stage separated and the solar panels were deployed. Early telemetry indicated that there was a leak in one of the gas valves in the orientation system so the spacecraft was transferred to gyroscopic stabilization. Sixty-one radio transmissions were held, initially at two day intervals and later at 5 days in which a large amount of interplanetary data were collected. On 21 March 1963, when the spacecraft was at a distance of 106,760,000 km from Earth on its way to Mars communications ceased, probably due to failure of the spacecraft orientation system. Mars 1 closest approach to Mars occurred on 19 June 1963 at a distance of approximately 193,000 km, after which the spacecraft entered a heliocentric orbit. Spacecraft and Subsystems. The probe recorded one micrometeorite strike every two minutes at altitudes ranging from 6000 to 40,000 km due to the Taurids meteor shower and also recorded similar densities at distances from 20 to 40 million km. Magnetic field intensities of 3-4 gammas with peaks as high as 6-9 gammas were measured in interplanetary space and the solar wind was detected. Measurements of cosmic rays showed that their intensity had almost doubled since 1959. The radiation zones around the Earth were detected and their magnitude confirmed. Also launched in the same launch window was the similar 2MV-3 Mars lander, which was unsuccessful.